Sherie has been doing the math on the average speed and time limits for the cutoffs for the various Maratona courses. She feels she has the strength to complete the entire ride, but may not be able to do it in the time limits. So she wanted to ride a Selle Ronde (around the Selle group), which is the first loop of the race, to better understand the pace needed to be in time to be on the longer courses. So off we went, instead of resting, to ride up the four passes around the Selle. Of course, the bicycle parade on Passo Campolongo was nearly continual. Ben and Sherie wore various GPC colors, and had greetings and conversations from other California riders. Jeff from Diablo Cyclists was riding with a group that also included a gentleman from Stockton. Their plan today was to go south a bit from Arrabba, then do Passo Fadaia past the Marmaloda, then return over Passo Sella and Gardena. A climb fest indeed. Anyway, Jeff was on his first visit to Italy, and marveled at the food, even in the most humble roadside cafe. His enthusiasm for the experience charged me up. As more people have been coming into the Dolomites, our hotel has been filling, and the roads continue to see more traffic. While the most drivers are polite, and do not attempt to pass cyclists dangerously, some motorcycles use these roads as race courses. They weave in and out of traffic in both lanes, often forcing a cyclist traveling downhill at 50 kph to 60 kph to stay well right. Often this is okay, when the site lines are good and the pavement smooth. But sometimes the pavement is rough or broken (yes, even in Italy where they maintain roads, winter weather takes its toll), I am trying to use the whole lane to avoid damage to bike or body by the ruts. Also, in Europe, many cars are diesel powered. This is fuel efficient. But for the ones that are not turbo-charged, the elevation causes quite a bit of black particulate exhaust. By the end of the ride, ones skin can feel greasy and eyes feel irritated. 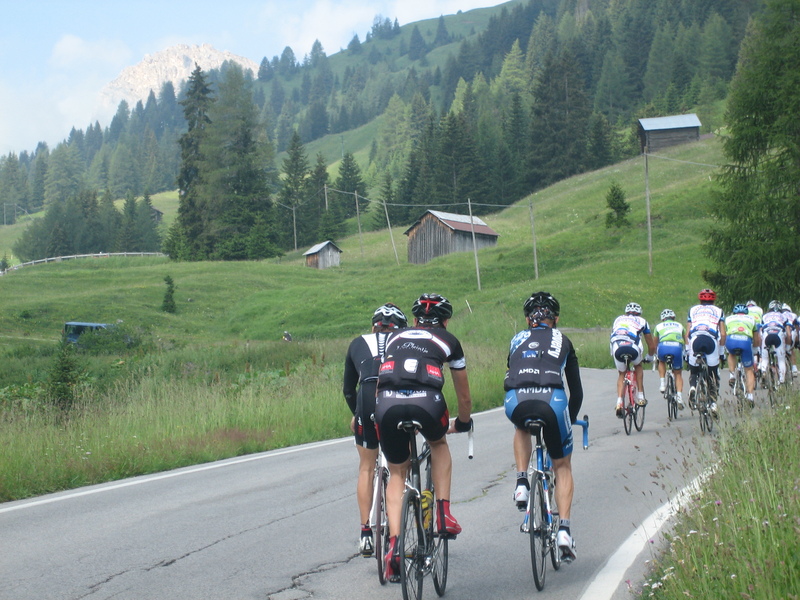 Rants aside, the scenery is spectacular, especially once over Passo Pordoi to the west side of the Selle Groupe. The escarpment towers in a continuous wall over the road, which descends and climbs around the flank to rise up the Passo Selle. While Pordoi was a long steady 6% to 7% grind, going something like 9 km and 630 vertical meters, Selle is shorted and stiffer, mostly at 10% or so, with pushes to 12%. While Ben had stayed close to Sherie on Pordoi, trying to stay relaxed, he needed to push ahead for the steeper ramps on Selle. After Selle, there is a nice downhill to the road that leads to Passo Gardena. Also, there is even a one km flat section of road, the only part of the 55 km Selle Ronde that is not up or down. Passo Gardena is neither steep nor long from Passo Sella (it is both from Val Gardena, but we met the road up high). 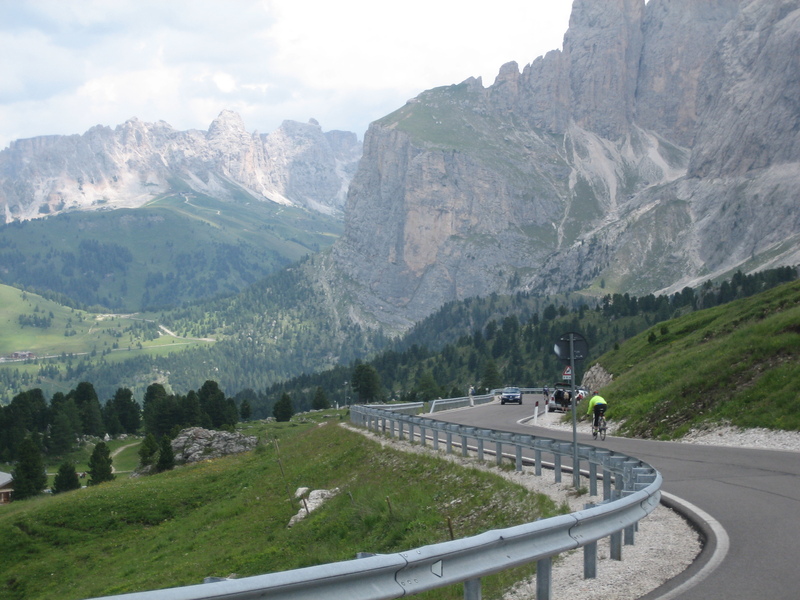 The back side includes many hairpins, steady grades, and lots of traffic on the way back into Corvara. A cyclist pretty much has to take a place behind the car/bike ahead and keep his place for the descent. 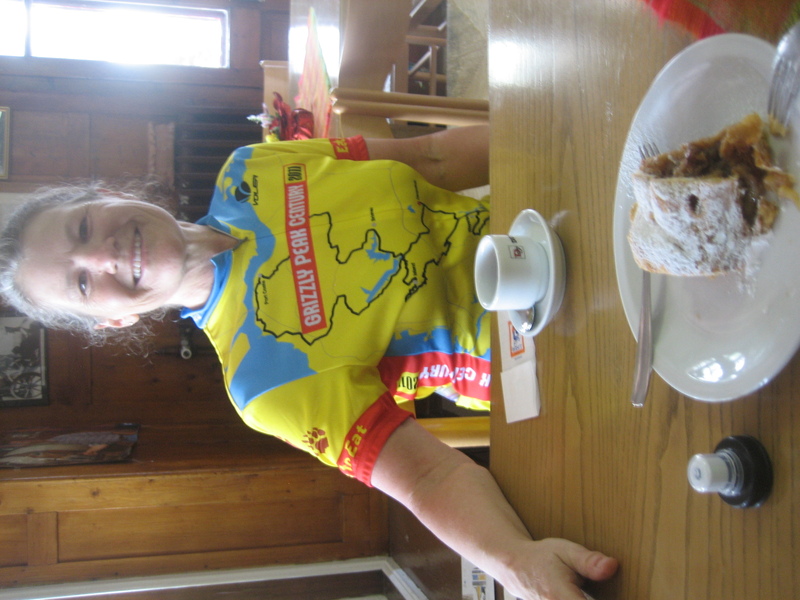 We had cafe apple strudel, Powerade, and espresso on top of Pordoi, but only brief picture stops on top of Selle and Gardena. Boy was the top of Selle a scene, as there is limited parking and gawking tourists in all conveyances. You know, the usual European scene. As for Sherie’s math, she figures she can go just fast enough to make the time cutoffs if she doesn’t stop long and pushes pretty hard. Sunday we shall see. After a lunch of fine but expensive pasta in Corvara (the weak dollar is killing the American abroad), we road our bikes to Badia to the Maratona Village. It amazed Ben how so many cyclists drove their cars to pick up their numbers and wander through the sponsors booths. A big crowd, a bag of sway, and our numbers and timing devices. 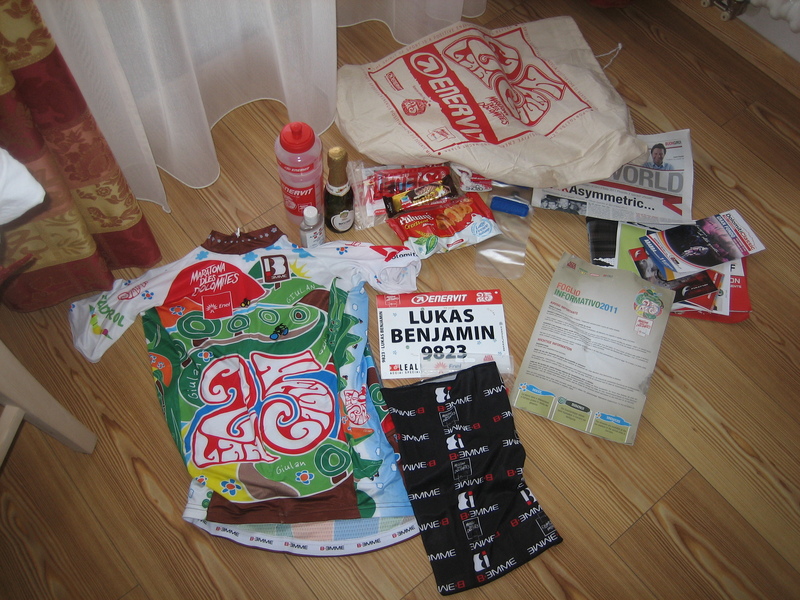 We even got a Maratona jersey, wild color print, with graphics commemorating the 25th edition of the race. And what one would never get in the states, a split bottle of Prosecco sparkling wine! On the ride back to Corvara from Badia, it rained. Lightly at first, then steady, then lightly again. It stopped just as we pulled into our hotel. Our first rain during daylight hours, not to mention while on our bikes, since the morning we left Borso a bit over a week ago.